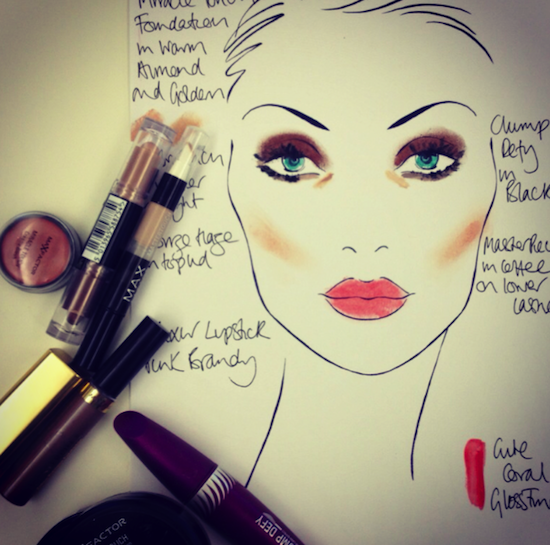 The face chart above shows the “Business Lunch” makeup look that I created with the help of Caroline Barnes, makeup artist for Max Factor*. You may remember from the “Blank Canvas” makeup look that I posted a couple of weeks ago that Max Factor asked me to create three makeup looks based on my different personas and roles. The first one was my makeup face for me as a model – it was very natural and clean and you can see it here if you missed it the first time around. This face is my “business” face – more polished and sophisticated and the kind of makeup that I wear if I have a day of meetings. On my cheeks I was supposed to be using the Miracle Touch blusher in Soft Copper but I changed my mind: I have become addicted to the powder Flawless Perfection Blush in 245, Subtle Amber. It’s gorgeous – a flattering powder that’s halfway between bronzer and blush. The cream blush would have looked fresher, I think, but I’d had my hair blow-dried and I was feeling a little bit Dallas! So, sweep of Subtle Amber on the cheeks and then it was on to the eyes. I used the Smoky Eye Effect double ended eyeshadow stick on my lids (shade 2, Bronze Haze) and blended it in with a shadow brush. If you find using these shadow sticks too messy then you can also apply with a brush rather than directly from the stick. This one blended so well and lasted all day once it had set. I used the Masterpiece Colour Precision Eyeshadow on the lower lashline and smudged that in well with my fingertips – the shade was called Coffee and it’s also gorgeous on the lids, just as a simple wash patted in or left alone. It’s a creamy formulation with a foam-tip applicator so handy if you want a quick shadow fix on the go. Mascara was Clump Defy, which I think is my favourite Max Factor mascara. I like the curved wand but I actually use it the wrong way up, for some reason, instead of following the curve of my lids. I find that it builds up better volume at the roots of the lashes. I also dodded some on the bottom lashes, but kept it to the roots rather than creating spider legs, just for some definition. The lipstick is probably the most eye-catching part of this look – it’s quite a bright coral and I’d not normally go for something so punchy in the daytime, but one must experiment with these things! I quite like matchy-matchy lips and nails and so I went for Pink Brandy in the Elixir Lipstick and Cute Coral in the Glossfinity polish. It’s a very good polish – long-lasting and an intense colour after two coats. What are we thinking, here? Do we like a little more makeup for daytime or do you prefer the first, “Blank Canvas” look? I think that I will always gravitate towards the less-is-more camp, but I do like a flash of coral for the summer. I think that you could also take out the coral lips and make the whole thing more sultry as the focus would switch to the eyes. Oh – speaking of eyes, I did tidy up a bit underneath with some concealer. 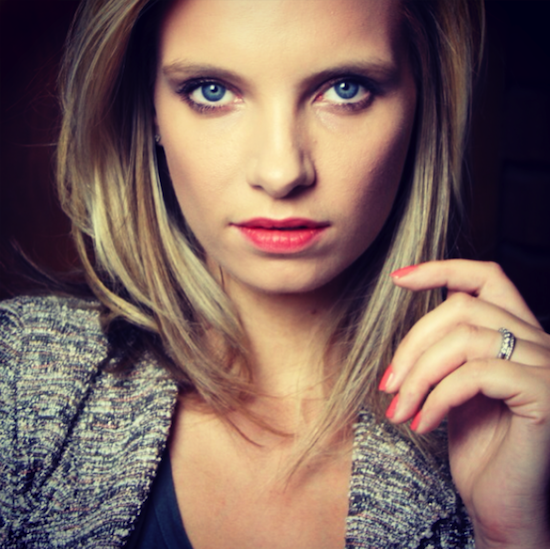 I used the Master Touch one in “light” – it’s a great texture, really light and easy to pat in. My hair had been blow-dried after I had my colour done so it’s quite “President’s Wife” when you see it with my makeup done and my little sparkly Zara jacket on!